Whether you're looking for a thoughtful and practical baby gift or want to make something for your own little one, handmade crochet booties will keep little toes warm and fashionable. This pattern is suitable for anyone who has basic crochet experience. To download this free pattern, click on the image or the image caption below. The PDF printable pattern will open in a new tab or window and you can either download it to your computer or print it out. If you run into problems downloading, try these tips for troubleshooting. 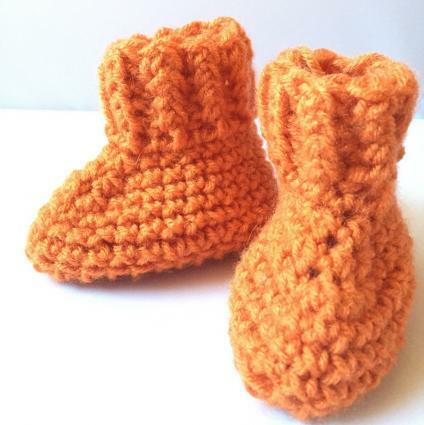 This fun bootie pattern is perfect for the novice or experienced crocheter. The finished booties will fit babies three to six months of age, though you can follow the instructions in the pattern to adjust the size and make them larger or smaller. Click here to download this pattern. Here are some more fun bootie patterns to try. Wrap-Around Baby Boots - These adorable boots are a bit more refined looking and finished off with a button. The pattern is suitable for newborns, up to three months. Fun Rain Boots - Dress your little sweetie up on a rainy day with these cute little rain boots. They're certainly not waterproof, but they do look great! This pattern is for sizes six to twelve months. Cowboy Booties - For the little wrangler who needs some new kicks! These precious cowboy booties are unique and lots of fun. You can choose the small pattern (3.5-inch soles) or the large one (4.5-inch soles). 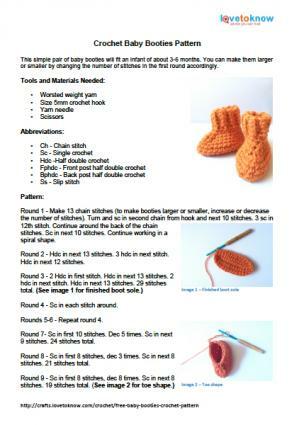 You can change the look of any bootie pattern by using different colors and styles of yarn for each pair. Organic baby cotton yarn will work up well and feel great on little feet.